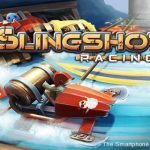 Slingshot Racing is an original twist on the well-worn racing genre. 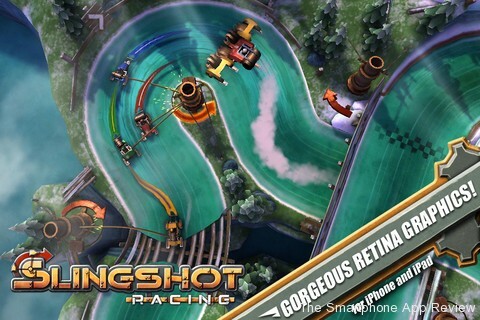 Its top-down one-touch gameplay provides a refreshing change from the clumsy steering systems of many iPhone racers. Rather than forcing you to battle with complicated car controls, the game instead asks you to touch anywhere on the screen to sling some rope at the nearest corner-turret. As the rope goes taut, your car careers around the corner. When you let go of the screen, the rope recoils and you continue forwards at whatever angle you left the turret. It’s an incredibly accessible system, but mastering it takes time. Driving into walls or taking corners too widely can drastically slow you down, so it’s vital that you leave each corner at the best possible angle. The core of the game is its lengthy career mode. 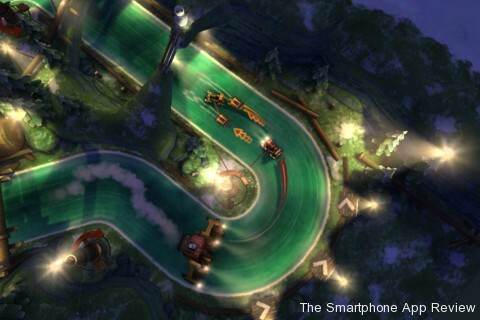 Beginning with simple tutorial races, the mode soon throws more challenging events at you. 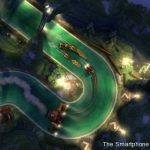 From timed races to an eliminator-style ‘Chomper’ event – where the four cars racing around the track are followed by the hungry Chomper, which gobbles down each machine from behind until only the front car is left on the track – there’s enough event types to keep you occupied for quite some time. In career mode, events are grouped into blocks of four. To progress past each block, you need to acquire a certain number of cogs: coming top in an event nets you three cogs, second earns you two and third leaves you with one. Coming last simply isn’t good enough. It’s a fair reward system that encourages you to replay your favourite events if you want to progress. The game contains 8 different tracks in total, but there isn’t much variety between them. The main negative of the control system is that it limits the track design by reducing tracks to containing clean-cut corners that can be navigated using slingshots. To add variety to the game, its developers have included speed boosts and snowmen (which block your path, slowing you down if you hit them) to some tracks. They go some way to keeping the game fresh, as do the app’s different event categories, but the repetition of tracks does begin to wear after a while. As well as career mode, there’s a tournament mode that allows you to play a custom number of local multiplayer races. Up to four people can race on the same touch screen each corner has a small slingshot button, each controlling a different car, which each player must use to fling their car around the track as efficiently as possible. I only had the opportunity to test multiplayer briefly, but found it just as fun as the single player mode. If you can’t persuade others to play with you, you can also choose to play against computer-controlled cars and to reduce the number of cars racing around the track. Graphically and aurally, the game is top-notch. It contains character, charm and a distinctive steampunk style well suited to the gameplay. The game is also very accessible – menus are easy to navigate and the tutorial levels are clear enough that anyone can pick up the app and start playing. 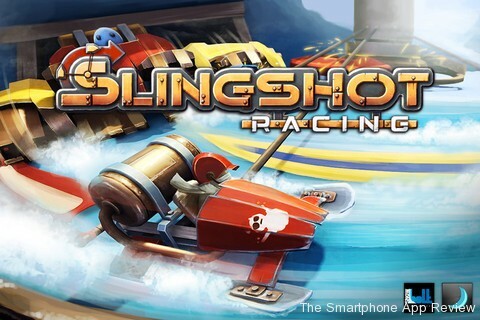 Overall, Slingshot Racing is a simple, accessible and original racing game for the iPhone. 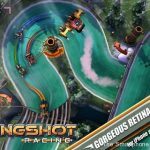 It’s packed full of content, a fair amount of variety and is also an enjoyable multiplayer experience. For $2.99, it’s definitely worth checking out. Check out our reviews of WarGames: WOPR, Human Defense, and Tiny Troopers!